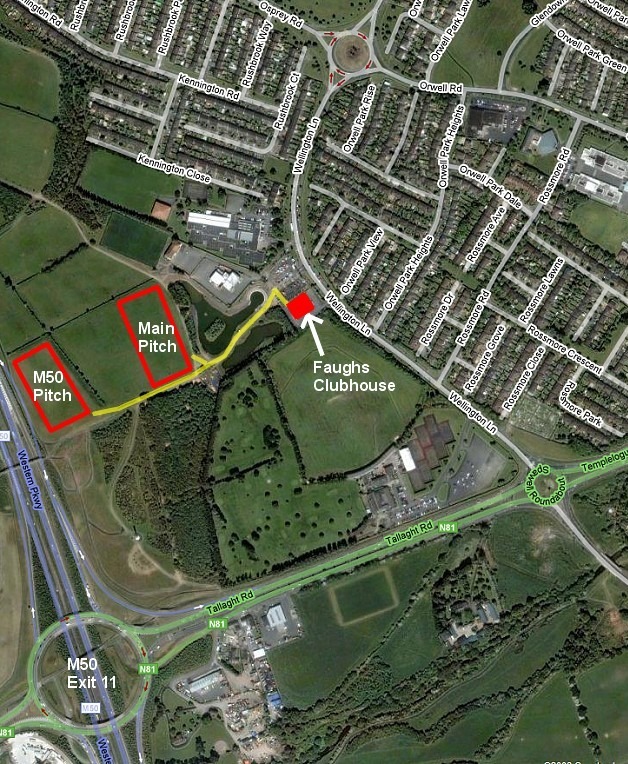 Faughs GAA Clubhouse is located adjacent to the Wellington Lane entrance to Tymon Park in Templeogue, Dublin 6W. There are 3 pitches in Tymon Park and an enclosed juvenile pitch at Kimmage Manor. Click links below for directions and maps. From M50, take exit 11 (N81/Tallaght exit) and head towards city centre / Templeogue on the N81. At the first (Spawell) roundabout turn left onto Wellington Lane (signposted for Crumlin). Clubhouse entrance is 500m from the Spawell roundabout on the left hand side. 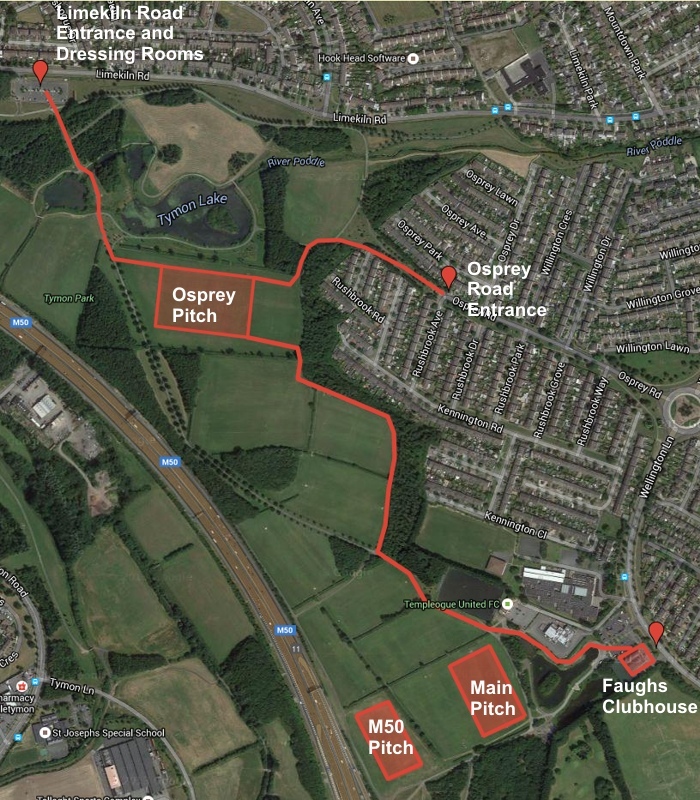 Osprey pitches are 10 minute walk from the Clubhouse / Wellington Lane entrance to Tymon Park or 5 minutes walk from the Osprey Road entrance to Tymon Park. Main Osprey entrance gate is only open during normal park opening hours. If it is closed, use the nearby entrance in Osprey Drive which is always open. Directions From M50: Take exit 11 (N81/Tallaght exit) and head towards city centre / Templeogue on the N81. At the first (Spawell) roundabout turn left onto Wellington Lane (signposted for Crumlin). Clubhouse entrance is 500m from the Spawell roundabout on the left hand side. To get to Osprey entrance to Tymon park, continue on past clubhouse to next roundabout. Turn left at roundabout onto Osprey Road and continue on for 400m to come to park entrance. 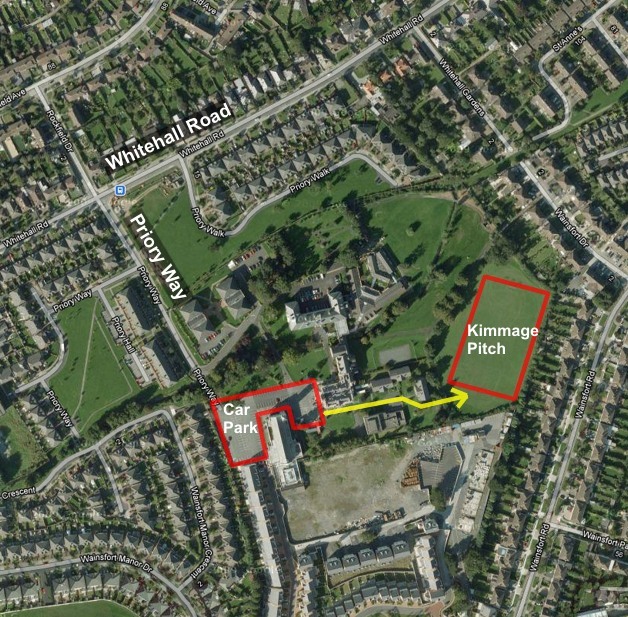 Kimmage Manor Juvenile pitch is situated in the grounds of Kimmage Manor, adjacent to Kimmage Manor parish church. Entrance is from Priory Way, off Whitehall Road, Dublin 12. Please park in Church car park and walk down to pitch. Please do not park on the road that leads down to the pitch entrance or in the parking spaces opposite the pitch entrance. Please keep the noise and exuberence levels down in the vicinity of the church, particularly when Mass or funerals are ongoing. 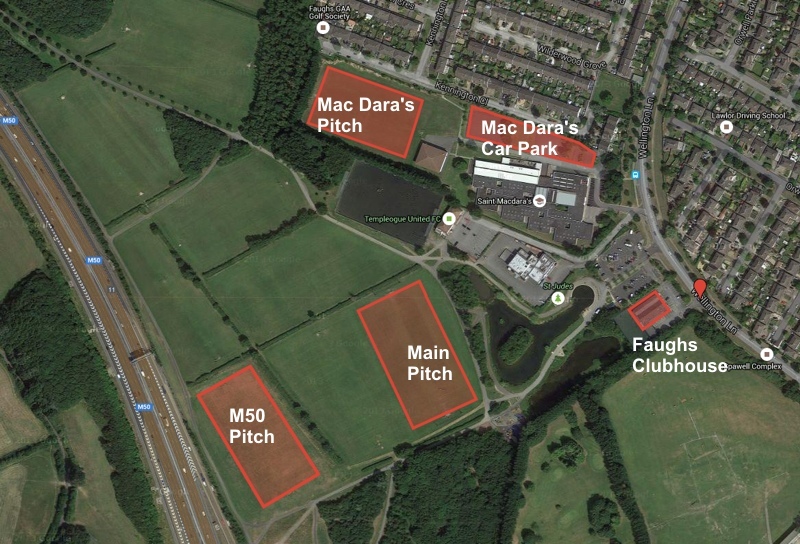 Mac Dara's School pitch and car park is situated next door to Faughs Clubhouse.